Alongside the Microsoft Lumia 950, Lumia 950 XL, and Lumia 550 launches, the company also announced the Surface Pro 4. 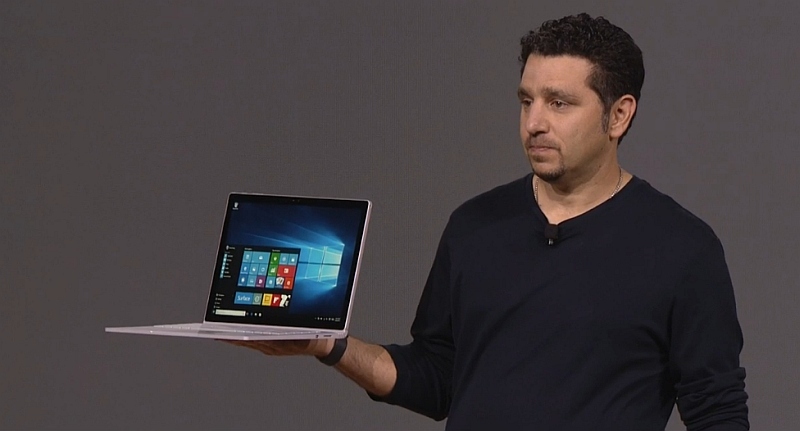 Microsoft unveiled the Surface Book as well, its first laptop. Both devices will come bundled with the new Surface Pen. The successor to the widely successful Surface Pro 3, the Surface Pro 4, is the 4th-generation of company's own tablet lineup. It starts at $899, with pre-orders beginning Wednesday, and it would commence shipping from October 26. The Microsoft Surface Book has been priced starting at $1,499 (roughly Rs. 97,800), goes on pre-order on Wednesday, and will also start shipping on October 26. The Microsoft Surface Pro 4 comes with a 12.3-inch (2736x1824 pixel) PixelTouch display with a 3:2 aspect ratio, but the size of the tablet is not larger than the 12-inch Surface Pro 3 as the company has reduced the bezel width. The display is protected by Corning Gorilla Glass 4 - which as the company noted is only 0.4mm thick. There is a new stylus too. The company is calling it Surface Pen and it comes with an eraser. The new Surface Pen can detect 1,024 points of pressure. You click the tip of the pen and the Surface Pro 4 opens Microsoft OneNote. Much like pretty much every device we have seen at the event, the Pen also comes with Cortana integration. 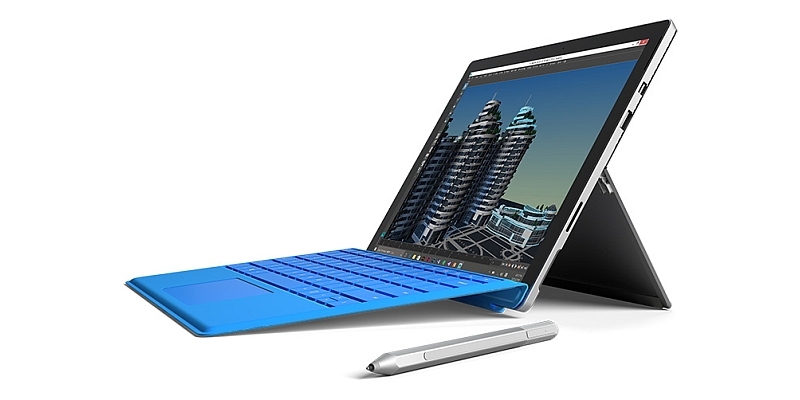 The Surface Pro 4 comes with a choice of Intel's 6th-generation Core processors, from Core M3, to Core i5 and Core i7. These configurations are powered by Intel HD Graphics 515, Intel HD Graphics 520, and Intel Iris Graphics respectively. The company says that the Surface Pro 4 is 30 percent faster than the Surface Pro 3, and is 50 percent faster than Apple's MacBook Air. It comes with up to 16GB of RAM (4GB base model), and up to a whopping 1TB of SSD storage (starts at 128GB). It comes with a full-size USB 3.0 port, a microSD card reader, a 3.5-mm headset jack, a Mini DisplayPort, a Type Cover port, and SurfaceConnect port. Microsoft says the Surface Pro 4 will offer up to 9 hours of battery life. It bears an 8-megapixel rear camera, and a 5-megapixel front-facing camera. Notably, the Surface Pro 4 only ships with the Surface Pen in the box, and users will have to buy the Surface Pro 4 Type Cover ($129.99 or roughly Rs. 8,600), or Fingerprint Reader keyboard ($159.99 or roughly Rs. 10,600) if they want to enjoy the keyboard experience, as well as additional ports and sensors. Users can also purchase the Surface Dock ($199.99 or roughly Rs. 13,200) to get 2 Mini DisplayPorts, 1 Gigabit Ethernet port, 4 USB 3.0 ports, and 1 Audio out port. There is also a new Type Cover as well, which comes with more spacious keys on the keyboard. The Type Cover comes with a glass trackpad - which is 40 percent larger than its counterpart on the Surface Pro 3. It is lighter, thinner, and sturdier, the company claims. 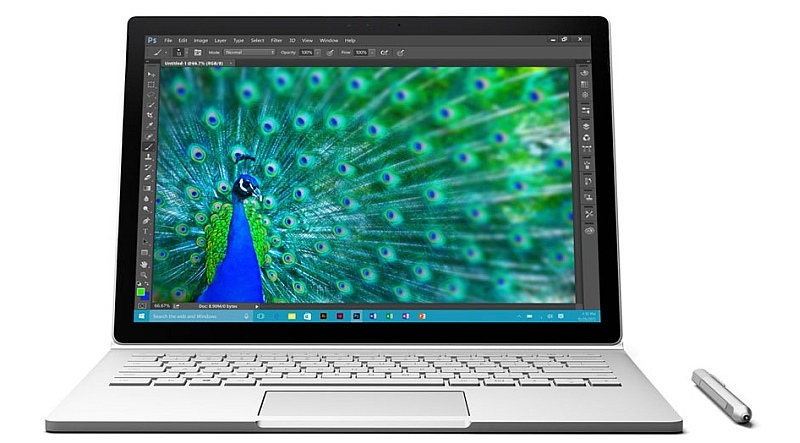 Microsoft also announced the Surface Book, the company's first laptop. The company claims that the Surface Book is twice as fast as the MacBook Pro. It has a 13.5-inch PixelSense display with resolution of 3000x2000 pixels, and a pixel density of 267ppi. It has the same Corning Gorilla Glass 4 screen protector. The company says that it has the best-in-class key stroke and backlit keys. The trackpad has five-finger multi-touch support, while the display has 10-finger multi-touch support. The Surface Book, much like the MacBook Air, is claimed to last for 12 hours on a single charge. Sensors include ambient light, accelerometer, gyroscope, and a magnetometer. The Surface Book weighs in at 1.52kg including the keyboard, which can also be detached from the Dynamic Fulcrum Hinge. Microsoft is touting the use of the Surface Book's display as a tablet, showing off Clipboard functionality. The keyboard dock contains the GPU, and two USB 3.0 ports. It measures 312.3x232.1x13.0 - 22.8mm.